Borough are going through a difficult patch, not having a designated keeper is not helping, that said they outfield group are not playing as well as I have seen them play. Clee Reds on other hand are improving week by week. A Three nil half time lead was reduced to 3-1 straight after break – was the fight back on the cards? Previous ‘reds’ may have capitulated, not current group who weathered the storm, regrouped to take a 6-1 lead; two late Borough goals flattered score line, but was needed earlier to cause damage. That Cory goal, close to halfway line near to touchline he appeared to making a tackle, the power and timing in the tackle put the ball in the far top corner of the Boro net. Keeper not moving. Some goal. Galacticos are playing some ‘proper’ futsal; team can give anyone a game. Clee would never claim to be best, but what they can do is play with a smile every week; which in itself is a win. After a slow start Galacticos was 4-0 ahead; right up to 5-9 Clee was playing as well as I have seen them play, a late collapse spoilt score line in an entertaining match. Title aspirants All Stars had bare five players whilst Laceby had to substitutes to call on. From the start All Stars was always behind, that is until they levelled to 3-3, the last two minutes was tense to say the least; Laceby smelled victory; All Stars was out on their feet; and yet somehow they mustered a goal. Blood; sweat and three points. 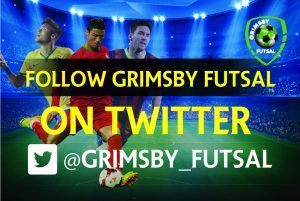 Think you can play futsal, want to play futsal – enter now! 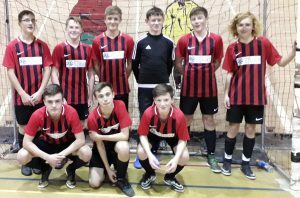 This entry was posted in Grimsby Futsal League on January 24, 2019 by Kevin Bryant.